1:43 – Hard rain comes down as soon as Tiger hits driving range. Seeks shelter under black AT&T umbrella the size of my apartment. Tiger puts on black windbreaker, hiding red shirt, giving field false sense of security. 1:46 – Too many golfers wearing white slacks today. Camilo Villegas, Phil Mickelson, Zach Johnson. Looks like they raided Ken’s closet. I can’t wear white to golf course. Get too dirty wiping dirt from irons on thighs. 1:48 – Rain continuing to come down as Padraig Harrington also hides under large umbrella. Hoping tourney not postponed until tomorrow. Will have to call in sick. Imaginary boss would be miffed. 1:55 – Television coverage about to switch from TNT to CBS. I’ll miss Ernie Johnson but won’t miss incessant Jada Pinkett Smith promos. How long until basketball season? Setting over/under on number of times CBS promotes upcoming 60 Minutes Michael Vick interview at 12. 2:12 – University of Minnesota great Tom Lehman walks to 18th green holding Golden Gopher driver cover high in air to round of applause. Elsewhere in state, Kevin McHale looks for job. 2:23 – Verne Lundquist piece recollects Tiger’s “famous finger point” and “double fist pump” moments of majors past. Wonder what he’d call this Mickelson moment. 2:28 – Singh cans ridiculous, 50-foot birdie putt on 6 to go to two-under par. Still six strokes behind Tiger. 2:43 – LL Cool J starring in “NCIS:Going Back To Cali?” His head is starting to look like Barry Bond’s. I’m not sayin’, I’m just sayin’. 2:48 – Tiger’s introduction at first tee longer than Apollo Creed’s in Rocky IV. Tiger proceeds to rip Drago-like drive down middle of fairway. 2:52 – Tiger knocks approach shot on first hole, leaving ball five feet from pin. Could be long day for field if Tiger makes early statement. Tiger misses putt, pushing it left. Surprisingly doesn’t curse. 3:07 – Just had first drink. Promise chat will get funnier. 3:10 – CBS airs first of several Vick previews. Told ya’. 3:12 – Tiger opts for iron off second tee. Yang crushes drive. Tiger puts approach closer than Yang but both miss putts. Meanwhile, US Open champion Lucas Glover birdies third hole, moving three shots behind Tiger. 3:25 – Tiger puts drive on 3 into left side fairway bunker. Not doing himself any favors on par 5’s. Hasn’t birdied a par-five since Friday’s round. Will likely need to in order to sustain lead. Glover birdies fifth hole to move two shots behind Tiger. Yang birdies to move one back. 3:38 – Through Frank’s recommendation, I switch over to see Usain Bolt. First time this television has displayed track and field. Sportschump.net promises to provide more balanced sports coverage while not donning spandex track outfit. 3:45 – Bolt is a freak!!! 9.58 seconds into a headwind. New world record! 3:57 – Back to golf. We missed a Tiger bogey on 4 and probably two 60 Minutes promos for Vick interview. After Yang bogey on 5, Tiger still holds one shot lead but he’s being very undudelike. Paddy one back. 4:11 – Third promo for Vick interview. Aforementioned over/under of 12 looks like it’ll be on the money. 4:20 – Tiger very conservative this Sunday. Likely hasn’t hit a shot he’s happy with all day. 4:21 – File under things we’ve never seen… Padraig Harrington almost hits Henrik Stenson with errant approach on 7th hole. Tempers between Ireland and Sweden flare. Remiscient of Bridgestone, Harrington then puts next shot into water. Needs calculator and first aid kit for score. Ends up with 8 on par 3. 4:36 – Tiger bogies 8th hole, now two over for round. Yang misses four-foot putt and opportunity to take outright lead. 4:55 – Tiger must be living right. His tee shot on the par 4 10th hits tree and bounces back into the fairway. Announcers and every one else watching wonder why he’s playing so conservative. 4:59 – Tiger finally puts approach close enough for makeable putt and first birdie of today’s round, but so does Yang. Yang only golfer hanging with Tiger. All other golfers, Westwood, Glover, Stenson, all three back of leaders. 5:04 – Yang misses birdie putt, leaving it less than an inch short. Tiger misses as well. 5:14 – Tiger finally gives himself a look at an eagle putt, reaching the 600 plus yard, par five 11th in two shots. Has trail mix to celebrate then birdies hole to take one shot lead. 5:41 – CBS producer and/or cameraman fall asleep on job so we can’t see Tiger’s tee shot on 13. I hear Verne Lundquist tells me it’ll give Tiger a birdie look. I’ll have to take his word for it. 5:36 – Tiger misses par putt on 12th. Moves back into first place tie with Yang at 6-under. Els now at 3-under. Woods will have to start manufacturing some shots or hope for Yang meltdown. Elsewhere, the Ying Yang Twins are still enjoying royalties off their Whisper Song. 5:46 – Tiger misses putt. He’s not happy. Yang makes his. Still tied with five holes to play. 5:57 – Yang chips in for eagle at the 14. Down by a stroke, Tiger calmly birdies. Four holes to play but Yang shows no sign of folding. 6:11 – Does anyone have any idea who’s on 60 Minutes tonight? 6:19 – Tiger misses another birdie opportunity on 15. Yang still holds one shot lead. CBS announces, with victory, Yang would become first Asian-born player to win a major tournament on the PGA Tour. Tiger’s mother immediately begins rooting for Yang. 6:38 – With two holes to play, Yang still leads by one. Barring Yang meltdown, Tiger’s goose could be cooked. LeBron James tweets him and tells him to leave golf course without shaking Yang’s hand. 6:49 – After both bogeying 17, Tiger and Yang head to 18 with Tiger down a stroke. Anyone nervous? 6:57 – Yang hits ridiculous hybrid shot leaving ball seven feet from pin. Tiger’s record now blemished. PETA people put popcorn in microwave for upcoming Vick interview. This entry was posted in Life of Sports Chump, Screen, Tee Box and tagged Kevin McHale, Michael Vick, Padraig Harrington, PGA, PGA Championship, Phil Mickelson, Tiger Woods, Tom Lehman, Vijay Singh, Y E Yang, Zach Johnson by Chris Humpherys. Bookmark the permalink. Thanks, DB. Stay tuned. More to come. GREAT DAY FOR SPORTS! I’m flipping back from the PGA Championship to the Michigan 400 to the IAAF Track and Field World Championships. Don’t forget that Bolt and gay go head to head in the 100M final at 3:30 EST! The Great Gator Debater… thanks for keeping me in the know. I better stretch out for the race. How much of a head start to you think I’d need to take those guys? we’d both need about a 50 meter head start and the worlds biggest fans at our backs. Either that or a ‘friendly’ visit from Jeff Gillooly. I don’t think I could do that on a moped. Thanks for the heads up about the race. No problem Chris…I couldn’t do that shot out of a canon going down hill! Back to the Tiger Woods Show……. Michael Vick promos running neck and neck with Cialis ads. Which one will you see more of? DB… not sure what that says about the golfing demographic. Isn’t “The Dog Whisperer” on 60 minutes? just delete the ones you don’t like . J Dub… you just jinxed Yang. Well that looks to be that. Well there was the saying that only certainties in life …’were death , taxes and when Tiger’s leading after 54 holes. He’ll nail the win. WTF happened ? Y E Yang beat him at own game . And Tiger ended up looking a mere mortal. He looked shell shocked in his post tournament press conference . 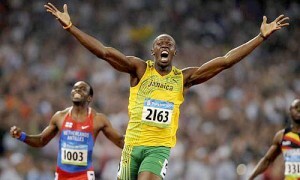 Well my Jamaican yardie Usain Bolt basically told the world …..’what a gwaaaan ? He made the guys in that 100m final’s field seem as if they were running backwards. 9.59 secs , he could’ve gone a great deal faster ! And here we go again . ESPN are now reporting that several unnamed Vikes’ players are stating that Brett Favre has stated that he may well come of retirement after having been in contact with them. Why can’t this story be put to rest once and for all ? Better yet can’t someone just put a muzzle on Favre’s friggin’ nozzle once and for all ? Is it me or is baseball getting a might dangerous at present? Kinsler of the Rangers gets beamed by a pitch. Kuroda is on the receipt of a line drive. And then the Mets’ David Wright is within inches of nearly losing his life after the pitch from Matt Cain. If MLB doesn’t do something with regard to protecting the players in terms of proper headgear. Someone will, either be seriously injured or actually killed in a major league game. Granted we all know that there are dangers to the game. But also there ought to be more being done to avoid some of the inherent dangers. Also the umpires have to be more consistent as to their rulings. Big ups to Jamaica and Usain Bolt ! Several of my friends couldn’t understand why I went friggin’ wild in a Hooters over the weekend in Lakeland, whilst that 100m race was going on. Busted out the Red Stripe in order to celebrate. As it was merely the Anglo-Carib in me , coming out. He’s going to do the same to the field, in the 200m , as well . And then the relay team’ll (4x100m) dominate as also. Al… It seemed like Tiger was playing too conversative from the getgo, as if her was playing not to lose. That’s not his game. Yang was not intimidated playing with Tiger because Tiger gave him no reason to be. Thanks to Frank, I saw Bolt run that race. You’re probably right. As they say in Dundee, he might could have had a faster finish time. Why am I not surprised at the Favre news? Al… that’s because they were watching NASCAR. One thing MLB can do if they want to lessen the likelihood of head injuries is levy lengthy suspensions against any pitcher who headhunts. Accident? Too bad. You’re fined 15 games. Hey, the NFL has a similar policy. No headhunting. If you start suspending pitchers for going high and tight, you might see a drop in the game’s concussion count. 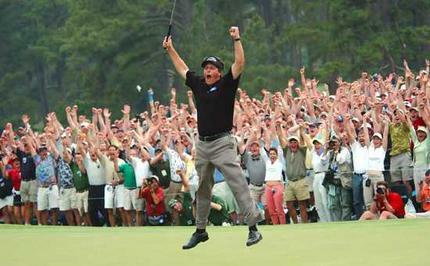 That was great golf by Mickelson in the Masters. You are right about that, DK. It was tough to watch the end and not shed a tear. You have some very thought provoking articles and view points, although I dont totally agree with everything in the article its still a very interesting opinion, look forward to coming back again soon. Have bookmarked you for future reference.